The first series of the crime drama starring Martin Shaw is bound for Blu-ray in January. In an early announcement to retailers, Acorn Media has just revealed 'George Gently: Series 1' for Blu-ray on January 17. Gently's reputation for honesty and relentlessness makes him almost as feared among his colleagues as he is among criminals. But he finds an odd ally in John Bacchus (Lee Ingleby, 'Master and Commander: The Far Side of the World')...an overeager young sergeant who plays fast and loose with police procedures...These feature-length modern dramas boast clever writing, stylish direction, and strong casts, including guest stars Richard Armitage ('Robin Hood: Season One'), Phil Davis ('Vera Drake'), and John Kavanagh ('The Tudors: Season 1'). The 2-disc Blu-ray set will feature 1080i video, an uncompressed 2.0 soundtrack, and the only supplement is text interviews with Martin Shaw, Lee Ingleby, and writer/executive producer Peter Flannery. Suggested list price for the Blu-ray is $49.99. 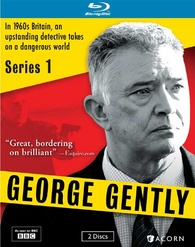 You can find the latest specs for 'George Gently: Series 1' linked from our Blu-ray Release Schedule, where it's indexed under January 17.